Madhubani painting is a typical form of artwork seen mostly in the Indian state of Bihar. We found this form of art simple yet beautiful enough for the children we worked with to learn and enjoy. The vibrant colours, symmetrical shapes and beautiful designs used in Madhubani art are helpful in teaching the children the basics of colour, design, and geometry. Along with our own journey in exploring this art form, one of our dreams of life is to teach this art form to as many people as we can. Trace the design on a paper. Paste a colored cardstock behind the art. 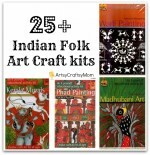 Madhubani paintings are traditionally done on canvas, handmade paper or cloth. 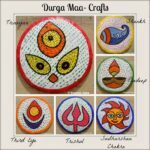 The link shows steps to make a simple Madhubani design on a mud pot.